To read this ARMA Fast Facts with all of the accompanying graphs and charts, please click on the PDF icon in the top right corner of this page. Founded in 1852, ASCE represents more than 140,000 members of the civil engineering profession worldwide and is America’s oldest national engineering society. ASCE 7-10 is a standard for engineering buildings to meet criteria for wind, earthquakes, snow loads and other design conditions. The standard describes wind load requirements using design conditions based on historical wind events. The wind load requirements defined in ASCE 7-10 are used as a basis for determining some requirements of building codes, including the 2010 Florida Building Codes. The calculations used in the code may affect product selection and installation methods. ASCE-7 was updated in 2010, and the new edition has now been incorporated into the model codes. Those codes are being adopted at the state level, and the change in wind speed terminology in ASCE-7 may cause some confusion in the market. 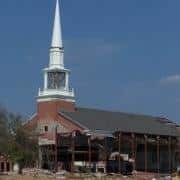 The First Baptist Church in Gulfport, MS, sustained heavy damage from a 25-foot tidal surge and hurricane-force winds during Hurricane Katrina in 2005. The new provisions set differing levels of wind speed requirements, depending on the type of building or “risk category.” For example, a school, hospital or emergency facility would have to meet higher wind speeds than a single-family residence; a retail store would have higher requirements than a farm storage building. The separate maps in the Florida codes establish the standard for the design wind speeds. Refer to the map in Figure R301.2(4) to determine the design wind speed for the specific project. Review the values for Maximum Basic Wind Speed in Table R905.2.6.1 to determine the lowest value that equals or exceeds the design wind speed in step 1 above. Contact your manufacturer or check packaging or literature for confirmation of classification from either ASTM D 7158 or D 3161 that corresponds to the Maximum Basic Wind Speed determined in step 2 above. The same process applies for commercial project selection, but the charts and maps used are different. What Does it Mean to Contractors, Property Owners and Specifiers?